Network Ministries, St Anthony Foundation and other Tenderloin agencies strive to increase technology use by offering computer classes and labs. But many Tenderloin residents may have old or obsolete computer equipment and software is often too expensive. 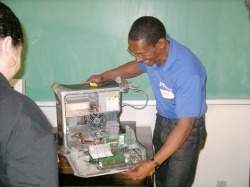 At this event, volunteers provide free technical support, demonstrate and install open source operating and virus protection software and provide one-on-one computer and Internet tutoring. rticipants will register in advance for whatever services they need. During the event, volunteers greet people on the street and invite them to come up to the event. Volunteers then meet people at the top of the stairs and ask a few questions about their needs for the event. Repair needs are referred to the Repair Room. Workshop are directed to a classroom. Others are directed to the computer stations in the computer lab for more information and individual attention. Volunteers are needed to set up and refresh refreshments for the volunteers and participants, to welcome volunteers and participants and to direct participants to the appropriate activity. Volunteers may also be asked to distribute information about the event to people outside the event. The Tech Triage volunteer matches incoming users with the technicalvolunteers best suited to help them. Each participant makes an appointment in advance. When they make their appointment and repair request, they are interviewed for basic information about their problem, the specifications of their machines, and operating systems (if known). When the participant arrives for their repair appointment, the Tech Triage volunteer quickly assesses the broad outlines of the user's needs, and sends them to most suitable available tech volunteer for those problems. If the problem cannot be solved with the resources at the event, the Triage Volunteer may provide other options or solutions for their problems. The Tech Triage Volunteer must be familiar with Windows and Linux-based operating systems and PC-based hardwared and software. Friendly, outgoing and bi-lingual preferred. 3. One-on-one Tutoring and Advice - Provide one-on-one tutoring to demonstrate how to browse the Internet to find useful information and resources. Volunteers work one-on-one with Tenderloin residents to demonstrate software and online resources that will help with their daily lives. Topics are determined by the clients and their interests. Possible topics include job search and casual labor resources, how to set up an email account, online GED or other classes, Internet safety, how to make a simple flyer, and additional training opportunities. No previous teaching or training experience necessary - just patience and enthusiasm.